Today is the traditional feast day of St Thomas Aquinas, patron of Catholic schools, confessor, and (Angelic) Doctor of the Church! The Blessed Thomas, Doctor of the Church, light of the world, glory of Italy, virgin shining with the bloom of chastity, rejoices in a twofold crown of glory. The Badger Catholic recently covered a chapel about to be destroyed up in the Green Bay Diocese (something which I thought I chimed in on… must have been on Facebook?). He recently posted an update on the progress of that destruction which, for now, at least, has been postponed! What’s known as the “Red Chapel,” is owned by the Diocese of Green Bay and was scheduled to be demolished this summer, but the Diocese now says that plan is on hold. I think this is a really good development, even if it is a little disheartening. Why disheartening? I think it is an embarrassment that Catholics need to turn to secular institutions (in this case, the Brown County Historical Society) to save our Catholic landmarks. As the earlier article noted, construction of the chapel started at the same time as the construction of the Green Bay cathedral. Now, while a chapel might not be a priority (as it hasn’t been, for the last 40 years), there’s still something to be said for saving our old Catholic structures. If we let everything pass into decay that is old, what will we have left? Probably won’t be that pretty. Plus, what has Europe been doing for the last few centuries? Their cemeteries are usually comprised of super old buildings and structured, preserved for use, and continually used. We need to end this American habit of “have it built, wait a few decades, tear it down, and start all over.” The loss of identity, roots, and tradition is the root of some American ills, I’m convinced. And, according to the news, it seems the cost to restore it is around $200,000. Doesn’t seem all that terrible, all things considered. It’d be really neat to see some traditional group get together, work with the Diocese and Historical Society, and start a perpetual Mass society for the Poor Souls in Purgatory. There’s only a handful of groups I can think of that provide such a society (the monks at Papa Stronsay and St. John Cantius down in Chicago are the only two I can think of off-hand). But, it also seems like you could even try to wrap such a society “into” the plots at the cemetery for a “lower” cost, if the cemetery would want to “play ball” (both the cemetery and Diocese would need to be “in on it,” I think). I know I’d be looking to get a plot in a cemetery that had Masses said for me each month (is this standard at Catholic cemeteries? I don’t really know). To get the $200,000 to restore, you’d need 1,500 enrollees in the society (a lot, but for a lifetime membership and monthly Masses, with a suggested donation of $150 per enrollee….). But, if you offered that option to people who purchase plots in the future as well, that’s a bit ‘easier’ to manage. I think it’s a great idea! Maybe I should write a letter to someone in the Green Bay Diocese? Regardless, it seems this little chapel might still be preserved! Let us pray they raise the money! St. Stanislaus Oratory on Milwaukee’s South Side has been making visible progress on its restoration! Hooray! As you might remember from my end of May/start of June roundup post, St. Stanislaus had some scaffolding hide the sanctuary. Well, this week, it’s finally (!) been coming down. This was at the start of the week, as the scaffolding began to come down…. More scaffolding has come down. Now the church looks short, but the paint looks AMAZING! I can finally see St. Dominic again! So very exciting to see the church restoration work continue. God willing, more money will continue to come to the oratory to complete the work in a timely fashion. Next up are the doors to the church, then after that, I think, comes the nave ceiling, then the stained glass windows. But, in the meantime, the scaffolding looks like it’ll all be down by the Feasts of the Assumption (Monday, August 15th). The ICKSP will be having a High Mass with candlelight procession at 6:30pm, with Benediction of the Blessed Sacrament to follow. 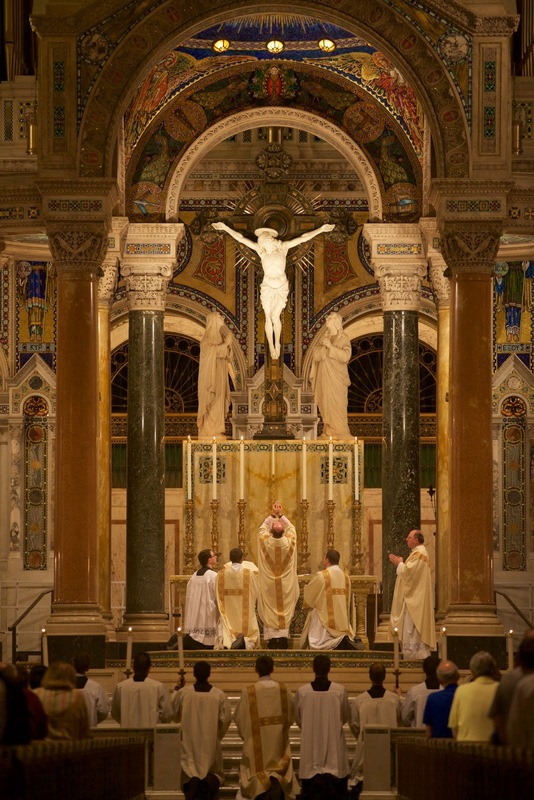 And, for the first time in a few months, Mass should be back at the restored high altar! Looking further ahead, mark your schedules for the weekend of September 24th and 25th. The 150th Anniversary Celebration of St. Stanislaus Parish is that weekend. On Saturday the 24th, a Novus Ordo Missae will be offered, and at 5:30pm, Benediction of the Blessed Sacrament with Te Deum, presided by His Excellency Archbishop Jerome Listecki will follow. On Sunday the 25th, at 10:00am, a Pontifical High Mass will be celebrated by His Excellency Bishop Joseph Perry, Auxiliary Bishop of Chicago, and the restored main altar will be consecrated. Should be a wonderful weekend of Catholicity, capped off by a proper consecration of the restored altar! The Badger Catholic posted an excerpt of Archbishop Listecki’s “Love One Another” column for this week. In this week’s column (letter? article? ), His Excellency tells about his recent interaction with Robitussin. Not only is the Archbishop able to find humor in dangerous situations, but he is also apparently a fan of one of my favorite jokes (as anyone who knows me can attest to…). I think the ending mention of “be prepared” is also an important one, and it shows the importance (and grace!) of having our clerics live together/in community, or at least somewhat close together. After a month’s hiatus, it’s about time I get back to putting words onto the screen and through the series of tubes to you (!) the reader. In lieu of any actual original topics for the moment, here’s a few thoughts on some articles I’ve come across the last few weeks. Over at New Liturgical Movement, Gregory DiPippo posted an article about “The Consecration of Westminster Cathedral“, reproducing chunks of a 1910 article from the Tablet. The long vigil of fifteen years has ended. Fifteen years of strong endeavour have achieved a splendid triumph. The crowning act was the Consecration on Tuesday. The act was clothed with all the solemnity with which the Church, with its matchless heritage of ritual, knows how to surround its life and express its spirit. And now Westminster Cathedral takes its place among the great Cathedrals of the world, unique and original in design, itself alone, with its own message, and its own significance. You don’t often get flowery writing like they did “back in the day” (when journalistic standards meant something?). Plus, you get a contemporary account of a ceremony rarely (if ever) seen nowadays in our post-conciliar world. Then, you also get armed with anti-liturgical reformer arguments with examples of the Archbishop and his clerics pray the Office and commemorate such splendid occasions. If you want more things like that, I cannot encourage more the Google Newspaper Archive. I’ve spent many an hour combing through the treasure trove of Internet wonders (primarily for obituaries). Sadly, Google is no longer adding more content, which is a true loss. Next, Badger Catholic points its direction south of our border to the Chicago Archdiocese, and the on-going saga to keep St. Adalbert’s open. The following comes from a Chicago Tribune article on a possible future for the church. The Chicago Archdiocese is in preliminary discussions with the Chicago Academy of Music about purchasing the property and converting the church’s adjacent convent into dormitories for students, its rectory into housing for master musicians and its Italian marble sanctuary into a concert stage. Despite the Tribune article, the effort to keep Adalbert open as a church is not over—in fact, as I understand it, the appeal to the Vatican will proceed. And, despite the issuance of the decrees and the denial of an appeal to the Archdiocese, there will be Masses throughout July at least and, I believe, the Friday night prayer vigil and adoration (6-9pm) will also continue. The church is truly spectacular and I would urge any of your readers to try to attend Mass or simply visit during those hours that it’s still open. It is definitely the kind of church that will not be built again! Frankly, as good as it might be to see the church still stand, turning it into a secular concert hall perverts its purpose. At that point, I’d rather see the wrecking ball taken to it than see yet another Catholic edifice be turned over to profane use. The travesty of this is this is the culmination of decades of neglect, not only physically, as in the work the towers require to stay standing, but also spiritually and devotionally. Where are the current residents of the Pilsen neighborhood? Do they no longer require a Catholic church? Where are the priests that should have been formed and come out of this parish in the last 50 years? What of the religious sisters and brothers? Yes, it is good and fine that there is a small community working to keep their church open, but where was the truly hard (and rewarding) work that takes decades to do and see the fruits of? On top of that, there is the complete lack of stewardship (authentic stewardship) in this parish. This lovely church was built with the hardwork and dedication of the Polish immigrants, and now it is closed and the parish suppressed while Americans enjoy relative prosperity. What a shameful time we live in! For the Lord, mercy is necessary because there is sin, not because sin is “no big deal.” It is because sin is a big deal that mercy is needed and is glorious. Definitely worth the read (plus, it’s a bit shorter than his usual fare). Head on over and check it out! I was recently making my way through “The Divine Office, How to Say it Devoutly, How to Make it a Pleasure,” written by E.D.M. (Engant de Marie, Child of Mary), a nom de plume of Fr. Paul O’Sullivan, OP. Eventually, I came to the section I have copied below, and thought it a very appropriate section for consideration, particularly in this Year of Mercy. Mary’s great prerogative is Mercy. St. Alphonsus tells us that Jesus Christ has divided His kingdom with His Blessed Mother. He is King of Justice. He has made Her Queen of Mercy. Jesus came to us through Mary so He wishes that all His mercies, graces, and favours come also through Her. St. Bernard says that it was never heard of in any time, in any place that Mary refused a grace to anyone who called on Her for help, were he even the worst of sinners. How often has it happened that a poor sinner, whose life has been one long crime, lies dying without God, without sacraments, without friends, abandoned, alone. The demons stand around his bed, watching his laboured breathing, waiting for his last breath when he shall be theirs for ever. Weaker and weaker he grows. One moment more and he is irretrievably lost. But a long-ago memory, a thought of Mary flashes through his mind. He sends up one cry, one faint but confiding cry to His Mother in Heaven. She hastens to his side. He is saved.